Any new fan who becomes interested in boxing learns quickly that the sport is immensely subjective in nature, and that judges take a lot of heat regularly for controversial decisions. It makes sense then, to score every fight, as you would want a basis of comparison in case there was public outrage over a decision. Learning the art of scoring and then practicing it via judging fights gives the viewer a certain weight of expert authority compared to the fan who does not partake in judging. However, it does not address the root cause of controversial decisions, which arise because of varied opinions between judges and fans alike. It does not address the issues of subjectivity, which permeates the sport. As long as there is boxing, there will be subjectivity. One should try to be a human compubox, keeping a mental tab of punch count. But no one ever gives you straight answer on how to assign weightage to the quality of punches. Should a light jab be worth ¼ of a more thudding power shot such as a hook or cross? Should a cleanly landed punch be worth twice than that of a punch landed half landed and half absorbed the glove? We do not have such conversations in boxing, that is, the quantifying of something that is supposedly subjective. But without a quantitative framework, we cannot continue to act as if there is a right or wrong score. This is a real problem of boxing which never is discussed, as it exposes the sweet science’s lack of scientific rigor when it comes to assessing performance. When scoring fights, one should also consider the three other main factors in scoring, namely: aggression, ring generalship and defense. But again, it is absolutely shocking how certain media personalities will simply say that judges favor one over another, when in reality, they are supposed to take all three into account! One can even hear Max Kellerman say, that the way to score a round is to assess “who would you rather be in that round”. It is as subjective a criterion as there could be! It is madness. Let us turn our attention to the fight that took place on Dec 1st. Deontay Wilder vs Tyson Fury. I scored it 114-112 for Wilder. Does that shock you? Well, if you did not score the fight, and 99% of the viewers do not profess to have any method which they use to score, then you must forfeit your right to be shocked. In a round by round sport, it is critical that one assesses a winner for every round. If one do not participate in this process, then they check in their right to be shocked at another scorecard at the door. If one did score the fight, then the next logical question arises: what was the criteria of scoring? To which, there is no universal agreement. I gave rounds 1, 2, 4,9,11 and 12 to Wilder. Rounds 9 and 12 of course were 10-8 rounds because of the knockdowns. Hence, my score was 114-112 to The Bronze Bomber Deontay Wilder. I thought I would find some commonality with my scoresheet and Alejandro Rochin’s scoresheet, the only judge who had it for Wilder. While he gave all first four rounds to Wilder, to my surprise, he gave rounds 8 and 9 to Wilder as well! This is not the first such case either where a judge who scored it the same as me had different rounds for different fighters. This demonstrates the subjectivity that exists even amongst judges who have the same result. As long as we have the three judge panel, we will continue to have decisions that people will disagree with. Whether it is a classified a robbery or not depends the percentage of people who did not agree with the decision. What this also means is that there are “robberies” every weekend in the perspective of those who are in the less popular cohort of a decision. The solution to all this, if there needs to be one, is another matter. Perhaps I will write a piece in the future about how to reduce the subjectivity in scores in boxing, thus ensuring a more accepted and trusted method agreed upon by all. However, let us assume for a minute that nothing is going to change. What is the best scenario in such a case? If things continue the way they are now, one hopes that every fan embraces the subjectivity of the score and takes it upon themselves to score the fight. Is that what is happening now? No. Does the media play a role in swaying the fans one way or another? Yes, most vehemently! The boxing media despite being in the same ecosystem as everyone other stakeholder of the sport, seem to think that they are beyond subjectivity. We can argue about our scorecards, if you also happened to score the fight. Like with the Wilder-Fury fight, we can go back and forth as to why scored a certain round for a certain fighter. But to say that one party is somehow committing a grave sin if they do not agree with another is unacceptable! Yet, that is precisely what the Showtime commentators did for the whole fight. They all seemed to be in unison over Fury’s success, which is all right. But to then impose their own subjectivity to the whole world as the real McCoy was not right. It surely swayed many fans who might have been otherwise on the fence. Many of those fans then surely parroted what they heard on their TV screens, thus enhancing the drumbeat of the robbery narrative. The Wilder Fury fight was only one example of course. This will continue to happen unless we all first address the hard problem of boxing, the subjectivity of scoring. Boxing judges can be a lot like film critics. After seeing pretty much the same thing over and over again, both sets of professionals can sometimes be unduly influenced by the unexpected. Not something particularly good, mind you, just something unexpected. Boxing judges, like film critics, appear to love it when someone subverts their expectations. Unfortunately, many fans aren’t as impressed with originality for the sake of originality as judges and film critics seem to be. Take last year’s Star Wars film, The Last Jedi. Critics went nuts for it because it was so unlike other Star Wars flicks. Many fans, on the other hand, were far from impressed. Boxing itself recently went through a similar experience. 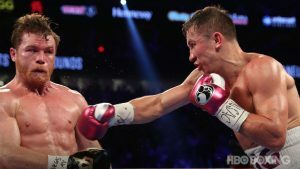 Most fans believed Gennady Golovkin clearly bested Canelo Alvarez in their Vegas middleweight title rematch earlier this month. Yet the judges, like film critics, saw things differently. Canelo, once again, walked out of a big fight with the blessing of authorities and a nearly perfect record. Why? My opinion is that the judges may have been impressed that Canelo did something he wasn’t expected to do against Golovkin, and that’s be aggressive. No matter that many didn’t feel he did enough to earn the victory. The fact Canelo subverted judges’ expectations might have been good enough for them. Again, it’s just my opinion, but I think there’s more than this one example available for me to build my case upon. Gennady Golovkin knocked a lot of people out before meeting Canelo for the first time in 2017. A lot of people. He didn’t knock Canelo out in that first match, however. 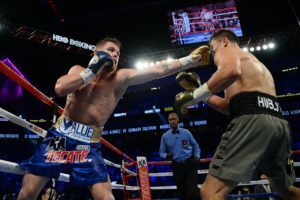 Canelo played defense and kept from being the Kazakh’s punching bag – in a sense, subverting expectations. The Mexican star walked away from that fight with a draw – even though most feel he lost that battle, much as most people feel he lost the rematch. That’s telling. Yet the power of subverting expectations can go back even further than this decade. Way back in 1987, when Ray Leonard came back with eye trouble from a long hiatus to take on middleweight king Marvelous Marvin Hagler (his full, legal name, by the way), many, if not most, felt Leonard was doomed. The thirty year old Leonard made a great showing of himself against Hagler, though. He was slick, energetic and impressive. Leonard won the bout on the cards that evening, even though many felt his performance, impressive though it was, wasn’t good enough for the decision. The fact that Leonard survived, however, that he had managed to hold his own, certainly subverted expectations. Hagler, likewise, didn’t live up to expectations by failing to completely demolish his popular counterpart, just like Golovkin didn’t live up to expectations by not completely dominating Canelo decades later. A piece of advice for judges – leave the expectations at the door, and just judge the fight on its merits. Hell, try pretending you don’t know the men or the women competing in the ring if you have to, just try to go the extra yard to be fair. Exhausted fans will thank you for finally subverting their expectations. 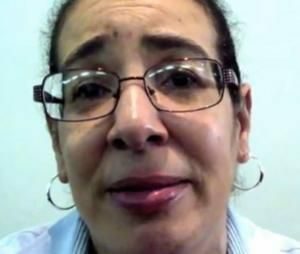 Adalaide Byrd’s recent 118-110 scorecard at the Canelo v Golovkin fight was seemingly outrageous. It left many out there, including myself, pondering the legitimacy of the whole thing. More fuel was added to the fire at last weekend’s heavyweight title fight between Joseph Parker and Hughie Fury who were contesting the WBO world title. In what was a close fight which could have gone either way, Fury probably didn’t do quite enough to definitively dethrone Parker. However, as the scorecards were read out, another 118-110 card appeared in favor of Parker. Fury and his team were livid and spent the rest of the night speculating about corruption in the sport to any media outlet that would listen. 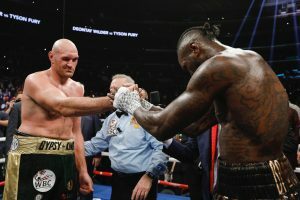 Thanks to fights like these, boxing fans have recently been become increasingly disillusioned and disenfranchised with a sport that seems to often be predetermined. However, what if there was a more innocent explanation? Boxing is subjective. Some judges prefer better technical work and boxing ability whereas many other judges will look for work rate and punches thrown. In this way, it is possible for two separate judges to view a close in favor of a different fighter. On the assumption there are no knockdowns each round would be scored 10-9 to whichever fighter each judge selected. Boxing scores do not leave space to account for how close each individual round was. In one round, a boxer can be punched around the ring, take heavy body shots, big uppercuts and spend the entire 3 minutes tucked up or staggering around the ring but provided they don’t hit the canvas, the round is 10-9. In another round, the contest could be incredibly close with both fighters throwing similar numbers of shots, landing similar numbers of shots and evading similar numbers of shots. However at the end of it, one fighter still wins the round 10-9. There is obviously a massive difference in these two rounds but this is just simply not reflected on the scorecards. Let’s take this a step further. For this hypothetical I will use Parker and Fury as my fighters. In this hypothetical scenario, one judge marginally prefers technical boxing ability and the other has a slight inclination towards work rate. The first round could be ridiculously close and the two judges in question could give the round to a different fighter. So after round one, one scorecard has Parker up 10-9 and on another Fury is up 10-9. If the second round is also very close, there is no logical reason why the judge would give the round to the other fighter this time. Perhaps he could worry that his scorecard might not reflect how close the fight is and give the round to the other fighter for this reason. However, it would be professionally dishonest for the judge to give the round to the other fighter simply because he was fearful of controversy. If the fight carries on playing out in this close fashion, the judge would carry on giving the rounds to the fighter he prefers by a miniscule margin. If we extrapolate this over the course of 12 rounds, it is therefore possible for our unbelievably close fight to be scored 120-108 to Parker by one judge and 120-108 to Fury by the other judge. Any assumption that a close fight should be scored 114-114 is simply illogical. This type of thinking reflects the flawed logic in what is known as the gamblers fallacy. This is the idea that because you flip a coin once and it lands on heads, it is more likely to land on tails the next time. In reality, the chance of landing a tail the next throw is identical to the first throw – 1 in 2. The parameters of each throw have not changed and the fact that the coin landed on heads the first time does not change the coin in any way and so it is no more likely to land on tails the next time. This same logic applies to boxing. Just because Parker scraped the first round by the skin of his teeth does not mean that if the next round is really close that it should be given to Fury. Perhaps then, both the Canelo v GGG and Parker v Fury scorecards were symptomatic of a close fight. It just seems very difficult to reflect that in the scoring system. 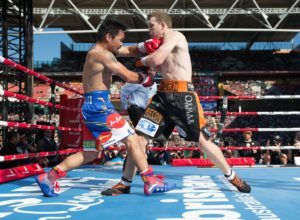 Whilst a 10-10 round is a possibility, it is used infrequently both official scorecards and TV scorecards. Perhaps it is time to get a bit more trigger happy with it? I have been training professional and amateur boxers for many years. In totality my fighters have competed in thousands of fights at nearly every level in the sport at one time or another. My athletes have competed for professional world titles, have been in the Olympics and have appeared at countless club and amateur level shows and tournaments. A few years back, I was part of the organizing team for a national amateur tournament being held in Michigan. One of my roles that week was to be a liaison between the organizing committee and any coaches who had questions or wanted to dispute a decision. If you have ever been to any boxing tournaments you know there are always disputes… and many times bad decisions, as well. It just so happens that the day before the tournament began I was meeting and greeting many of the coaches when I met and had a very nice chat with a coach who had two fighters there, one being his own son. He was a great guy! The next day I noticed that his son was fighting so I made my way over to that ring to watch the action. His son was a very good fighter, well trained and very sharp. His opponent was a little less refined, awkward with strange timing and movement…but still effective in a way. After the bell sounded to end the fight both boys jumped for joy and eventually met back in the center of the ring with the referee awaiting the judges’ decision. Both boys were sure they had won because their corners had told them they had. So they waited with anticipation in the center of the ring for the judges to announce the decision. Soon the announcer came on the microphone and announced…”the winner… out of the BLUE corner” and the boy and his coaches jumped for joy. The problem was the more technical fighter and the one I personally felt had won… lost! Needless to say, his father was very upset. I knew it was going to be an issue so I immediately went to him to try and calm him down but it was to no avail. He was very angry and the more I talked the more I could see he was getting more and more agitated. I stepped back and the father and son gave way for the next fight that was entering the ring and I gave them a few minutes to calm down before trying to talk to the father. He was a smart guy and the logic of my point resonated with him. After a few more minutes he had calmed down and he went to prepare his next kid for his upcoming fight. We parted friends. Here is the point; these things happen in boxing. No one is to blame, no nefarious intent, no incompetence on the part of judges… just a different point of view. The judge’s chair comes with a different perspective and set of responsibilities than you and I have as spectators. The judges are just human and for the most part they get it right most of the time. The fact is they are also as vulnerable as you and I are to our own biases and preconceived notions and despite the fact we want to believe we have a clear cut set of criteria on how to judge the big fights, the truth is we do not…and never will. Complete objectivity is difficult to attain. It’s inhuman in a way to be totally objective. We have our opinions and views of these fights and they are shaped by many things and we need to stop acting like the sky is falling every time there is a decision the majority of us might not agree with. I realize there was a lot of money at stake. I realize the history of our sport requires we remain vigilant at all times to keep the criminal elements away but to be honest, bad decisions and controversy are as much a part of boxing as the hook and the jab…and we like it that way! I loved the fight the other night. It was exciting, bloody and fun! 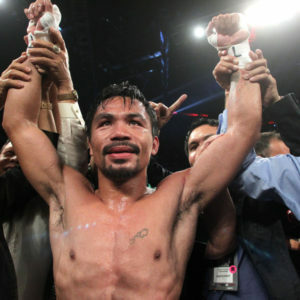 I felt PacMan won but both men emerged out of it ok and it was good for the sport. Picture, if you will, Las Vegas abuzz with screaming Irish fans and intense American fan boy love. The subject of all this wild admiration? One Conor McGregor. Now picture, if you will, McGregor doing more than anyone expected him to do against Floyd Mayweather. The Irishman is aggressive beyond aggressive for twelve straight rounds, displaying great heart and better than expected endurance. Sure, Mayweather clearly gets the better him, but McGregor impresses by virtue of not being humiliated. Now imagine the judges being taken away by the wave of that aforementioned ecstatic Irish and American fan boy love. Imagine them giving the decision win to McGregor…even though it’s clear for those who know boxing that Mayweather carried the night. Sound impossible? After this past weekend, I respectfully disagree. I find it to be entirely possible. Why? Because there’s a lot of incompetent judging out there these days. If it’s not at epidemic level, it’s clearly alarming. For one thing, crowds matter, and the T-Mobile arena will be a temple of McGregor worship on August 26th. Also, perhaps equally alarming, many judges appear to no longer understand that aggression is not the same as effective aggression. In other words, a good percentage of judges rule unprofessionally, if not all the time, then often enough. Keep in mind that Mayweather-McGregor is a pop culture event. When people ask me about it on the street, I find I’m at a loss for words. I’m a boxing writer, not a member of the staff of a big entertainment site. Those who are intrigued by Mayweather-McGregor are apt not to know much about how boxing is scored. Therefore, they’re apt to think McGregor wins if he performs like a poor man’s Marcos’ Maidana. And, again, they’re apt to influence the judges – who may, for who knows what reason, have one again forgotten what effective aggression is to begin with. So, will everyone be in an uproar on August 27th, the day after the Mayweather-McGregor Pop Culture Event Of The Summer? I wouldn’t have written this after Pacquiao-Horn and the Bounce TV brouhaha the night before, but now I wouldn’t be too surprised if incompetent judging proved to be McGregor’s secret weapon. Think it’s unlikely? You’re probably right. But I don’t think it’s as unlikely as you believe. Remember this – all McGregor has to do is stay on his feet and defy expectations and all bets might be off after the final bell. In other words, all the Irishman may have to do to win is look good. That won’t be easy, but it’s a lot easier than winning fairly. Of course, I’ll be watching Cotto-Kamegai on the 26th of August. It’s a far better matchup than Floyd-Conor. And besides, bad judging isn’t as painful when it doesn’t become an international incident. The Boxing portion of this year’s Olympic Games have been in full swing and slowly coming to an end. The first of the medals have been handed out and The United States has already done better than it has in the last 2 previous games. ​The International Boxing Federation, also known as AIBA, has issued a statement in which it conducted an investigation into fraud and/or corruption, due to the outcome of a few fights which have taken place during the tournament. AIBA stated that they had no conclusive evidence of any wrongdoing, but did dismiss several Judges and referees for performances “not at the level expected”. ​Here is a quick wrap up of who has taken home medals and which final fights are to come. A side note, all boxing weight classes award two bronze medals. The Gold Medal matchup will be between Robeisy Ramirez of Cuba and Shakur Stevenson of the United States. Stevenson will be attempting to become the first American male to win a Boxing Gold since Andre Ward did so in the 2004 games. Also, according to social media messages revealed yesterday, this will be Stevenson’s final amateur fight, as he has signed on with Floyd Mayweather Jr.s promotional company, The Money Team. AIBA represents 200 National Federations and has continuously sought to evolve the sport of boxing and continuously strive to ensure a level playing field. AIBA will not shy away from its responsibilities and is fully committed to a zero tolerance policy towards fair play in boxing, always acting in the boxers’ utmost interest. The Olympic Games represent the pinnacle of all sports and Boxing has been part of this since 1904. It is essential AIBA stands to the values of respect, sportsmanship, excellence and remains committed to a fair and transparent sport. With regard to corruption, we would like to strongly restate that unless tangible proof is put forward, not rumours, we will continue to use any means, including legal or disciplinary actions to protect our sport and its R&J community whose integrity is constantly put into question. The organization will not be deterred by subjective judgements made by discontented parties. We welcome all parties to come forward and provide evidence in order to take appropriate and immediate action.